Why did AT&T, a wireless phone company, want to own CNN, HBO and Warner Bros.? The answer has something to do with the ways that phones have changed our lives. There are also practical corporate concerns. AT&T thinks it needs to diversify; wants to own programming; and wants to keep Time Warner out of the hands of its huge rivals. Owning brands like HBO would give AT&T a lot more leverage. The answer to what's in it for Time Warner is fairly obvious: Billions of dollars. Analysts have long believed that Time Warner CEO Jeff Bewkes has been preparing the company -- a collection of businesses that make TV shows, movies and web sites, including CNNMoney -- for a sale. What's in it for AT&T? Growth and power. The constant connectivity provided by the likes of AT&T is powerful and profitable, but so is content. Think about the way you use your phone. Even in the age of Snapchat, you spend a lot more time watching media than you spend making it. And if you're anything like me, you're increasingly watching that media right on your smart phone and other mobile devices. These changes have meant the introduction of new ways to pay for entertainment; new ways to interact with sports; new ways to distribute news. That's where Time Warner comes in. Owning valuable programming -- in this case everything from "Game of Thrones" to "The Big Bang Theory" -- gives AT&T more power. 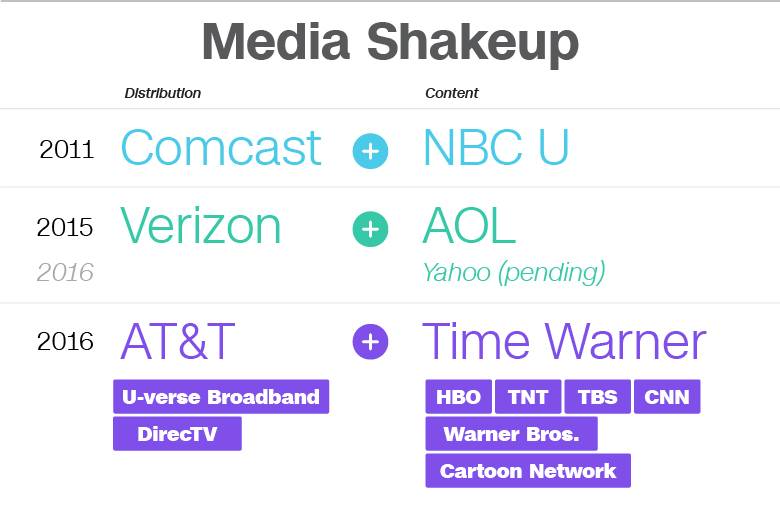 It gives AT&T more influence over what the "future of media" looks like. Other companies will have to negotiate with AT&T to gain long-term licenses for channels like TNT and the Cartoon Network, the same way they negotiate with Time Warner now. As evidenced by our consumption patterns, it is clear that the future centers around mobile viewing of TV, movies and other forms of video. AT&T's slogan is "mobilizing your world." Soon it could add "mobilizing your media." To be sure, synergy talk during a merger is sometimes overstated. The promised synergies during the disastrous AOL-Time Warner merger of the early 2000s failed to materialize. But it is easy to imagine connections between the distribution side and the programming side of the house AT&T would be building with this deal. Subscriptions to HBO and news apps from CNN could be sold right alongside wireless service -- all bundled as a part of a customer's monthly bill. AT&T already sells a combo package of wireless plus DirecTV satellite TV. And the company is preparing to launch a streaming version of cable, called DirecTV Now, that will let people stream dozens of TV channels for a monthly fee. Owning Time Warner could help AT&T with those ambitions. AT&T also gains Time Warner's 10% stake in Hulu, the streaming video service. The deal also elevates AT&T into rarefied air -- right alongside Comcast, which owns NBCUniversal. 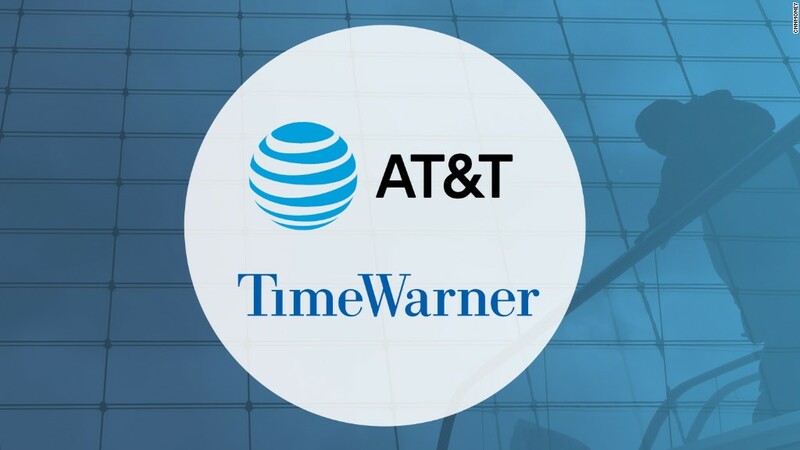 "AT&T acquiring Time Warner makes a great deal of sense, and it gives Comcast a real competitor with content and lots of conduit," cable industry consultant Paul Maxwell told CNNMoney. "But any real outcome depends upon government OK," he emphasized. The addition of Time Warner could also give AT&T a big advantage over Verizon, its primary wireless competitor. Both companies are running out of ways to grow in wireless, since most households have all the phones they need, and are already tethered to some company for service to those phones. Programming and advertising present new ways to grow -- though, given the problems the media industry is having, which are part of the reason that Time Warner is up for sale in the first place, they are not sure things. Verizon has shown interest in owning both content and the technology that controls digital advertising, as reflected by Verizon's purchase of AOL and its pending purchase of Yahoo. Both those deals are a fraction of the size of AT&T-Time Warner.